Each month brings its own list of landscaping tasks to keep your yard in top condition. 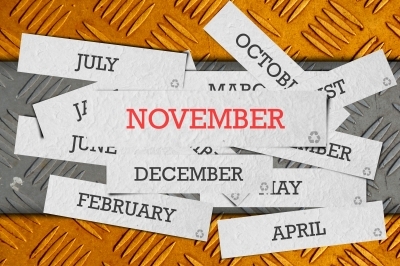 November is a transition month with the last vestiges of fall and weather patterns and temperatures that resemble the onset of winter which doesn’t officially occur until December. Overall the weather in the Atlanta area is definitely cooler but bright sunny days are still a regular occurrence. Mow, trim and edge lawn areas as needed. Begin shut down and winterization of irrigation systems. Apply slow release fertilizer to fescue lawns. Complete installation of fall color. Fall digging season begins. Install balled and burlapped trees and shrubs. Cut back perennials after 1st frost dieback. Those looking ahead to next year find this is a great time of year to plant new trees and shrubs so that they are well established by the beginning of the next growing season. This is also one of the last chances in the Atlanta area to install bulbs for spring flowers such as tulips. November is also a time for planning and late in the month begin installing Christmas decorations. Some people take their exterior Christmas decorations to extremes and more elaborate installations such as synchronized lighting to music can take up to a year of planning so perhaps this is the month you should start planning right now for next year! Hutcheson Horticultural is here to assist you with any of your November or year round landscaping needs. From seasonal trimmings and cleanups to installation of seasonal color we do it all and would love to speak to you about your landscaping needs. You can reach us via phone at 770-924-1001 or use the “Contact Us” feature on our website.